Minio is a popular, open-source distributed object storage server compatible with the Amazon AWS S3 API. You can use it with Elastic Cloud Enterprise installations when you want to store your Elasticsearch snapshots locally. We recommend following the Minio Quickstart Guide Docker Container instructions to create a simple Minio standalone installation for your initial evaluation and development. Be sure to use the docker -v option to map persistent storage to the container. 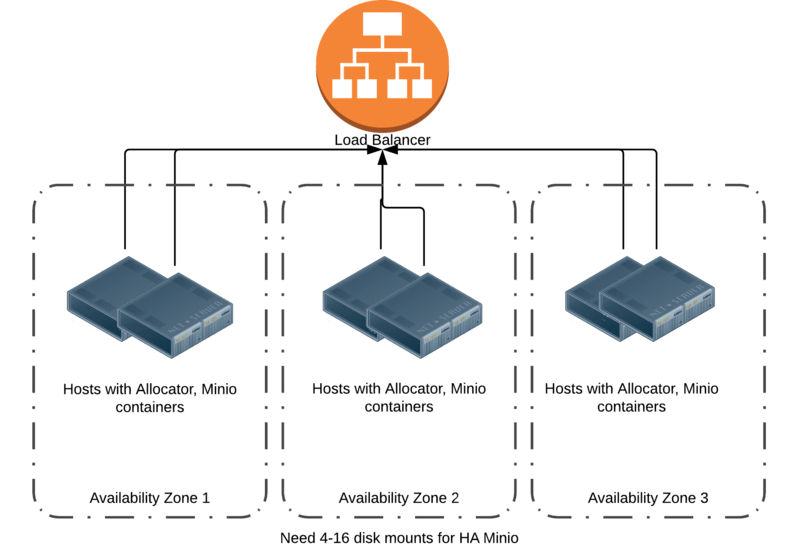 Installing Minio for production requires a high-availability configuration where Minio is running in Distributed mode. As mentioned in the Minio documentation, you will need to have 4-16 Minio drive mounts. There is no hard limit on the number of Minio nodes. It might be convenient to place the Minio node containers on your ECE hosts to ensure you have a suitable level of availability. Illustrated below is a sample architecture for a Large Elastic Cloud Enterprise Installation. Note there there is at least one Minio container in each availability zone. There are a number of different ways of orchestrating the Minio deployment (Docker Compose, Kubernetes, etc. ), we suggest you use the method most familiar to you. 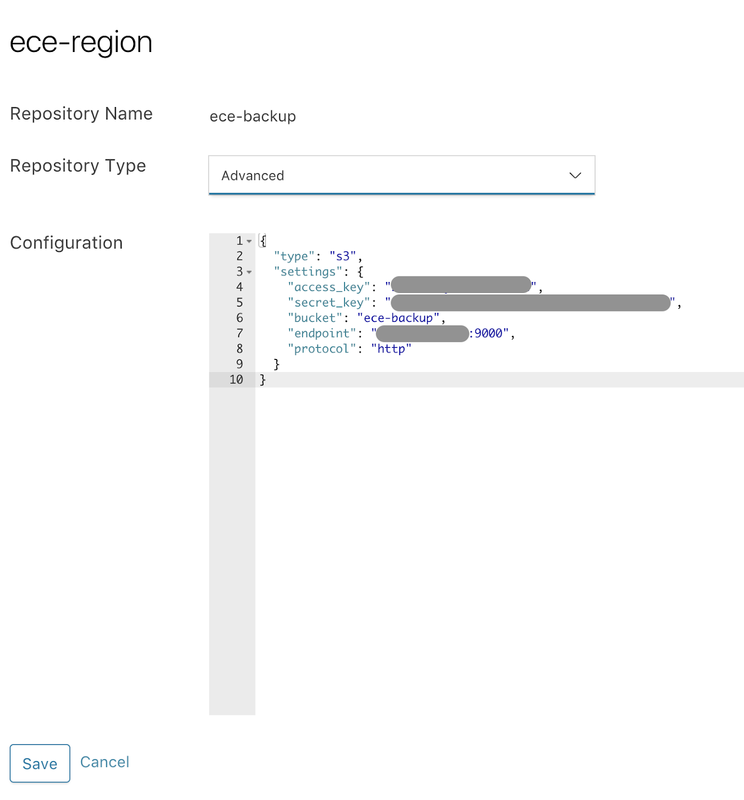 Using a single Minio endpoint with the Elastic Cloud Enterprise installation, to simplify repository management. Securing access to the Minio endpoint with TLS. Use a private Docker repository and install the Minio images in the private repository. Download the Minio images from an internet-connected machine, then use docker save to bundle the images into tar files. Copy the TAR files to the target hosts and use docker load to install. Minio might report various Endpoint URLs, be sure to choose the one that will be routable from your Elasticsearch Docker containers. For version 5.x, installing the plugin creates an S3 bucket for you. Using the Minio browser or an S3 client application, create an S3 bucket to store your snapshots. TIP: Don’t forget to make the bucket name DNS-friendly, e.g. no underscores or uppercase letters. For more details, read the bucket restrictions. Log into the Cloud UI and add the S3 repository plugin to your cluster. You can configure existing clusters, or create new ones, with the following changes to use Minio storage. 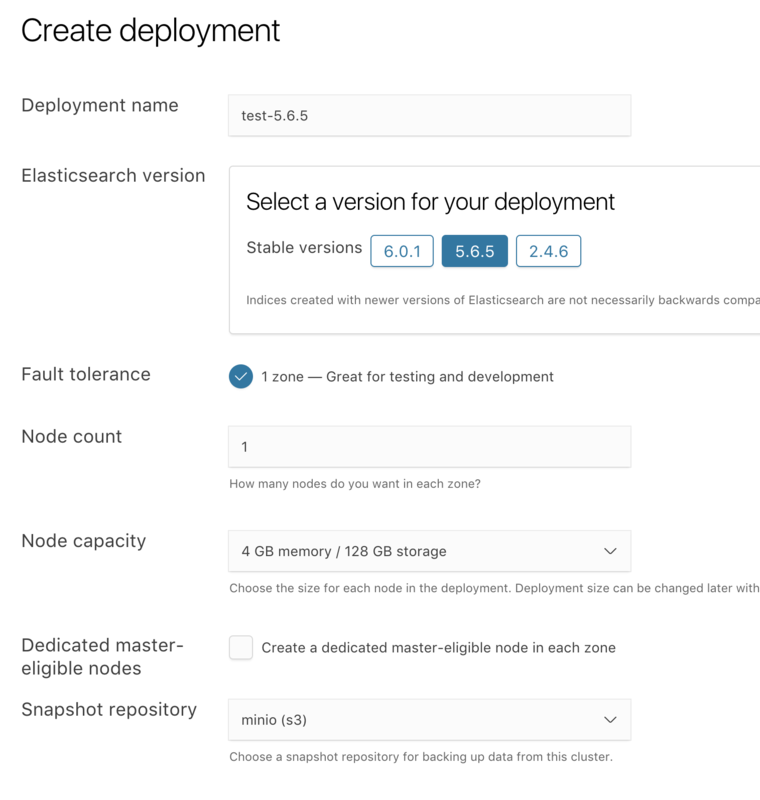 You must add the new repository to Elastic Cloud Enterprise before it can be used with your Elasticsearch clusters. Go to the Platform and then the Repositories page. Click Save to submit your configuration. The Minio repository is now available from the drop-down list of repositories when creating deployments. See the Elasticsearch S3 plugin details for more information. The configuration options for the Elasticsearch S3 repository plugin have changed from 5.x to 6.x versions and you must copy the endpoint and protocol values from your repository configuration to your User Settings YAML before you upgrade. The cluster should make a snapshot when the repository is set up, and you should see it by going to the Elasticsearch and then the Snapshots page. As an extra verification step, you can restore a cluster using the snapshots that have been taken. Get the plan from your test cluster. Go to the Elasticsearch page and then Edit. Click Advanced cluster configuration and copy the JSON format under the Plan heading. Create a new Elasticsearch cluster as your target. On the new cluster, click Advanced cluster configuration. In the transient section, add the restore_snapshot settings to the plan. Click Save to restore from the snapshot. When the plan update is complete, you should be able to see the restored indexes in your target cluster. More details are available to restore a snapshot.